Smart buildings are becoming more prevalent with IoT technology complimenting, and in some cases, replacing current building management systems (BMS). The deep networking ability of cloud-based IoT platforms and self-powered, maintenance-free sensors that can flexibly be placed everywhere in a facility, even on furniture, provide real-time insight into a building’s condition and technical health. There are a number of areas of facility management that fit into the IoT industry, with energy costs being a key aspect. Building automation companies can install smart systems including connected lighting systems, adding sensors into a system to determine how to control lights, whilst allowing facility managers or individuals to remotely control the lighting. Changing the lighting to save energy is one part of a key cost cutting tool for any business however large or small. Why stop at lighting usage to save energy? The IoT’s enormous potential lies in its interdisciplinary use of sensor data. For example, a motion sensor can control the lights and the room climate according to demand in order to save energy and also ensure comfort. The set temperature of offices can be a hot topic amongst colleagues, with some liking different temperatures to others. Using a motion and a temperature sensor and a couple of clever algorithms based on something like NodeRed, you could remotely control the complete HVAC system for a building e.g. if the temperature in a specific area goes above 22 degrees (Celsius), turn off the heating and increase the air conditioning to drop the temperature back to 22 degrees. Keeping a stable temperature is key to a healthy working environment and studies have shown this has made employees more productive (www.openworkspacedesign.co.uk/2015/12/11/the-impact-of-temperature-on-office-health-and-productivity). 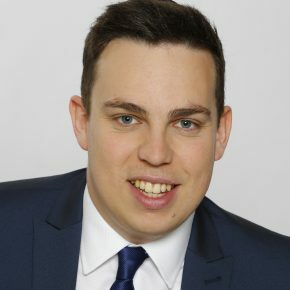 As a general rule, maintenance is carried out on devices and systems at regular intervals, but how often do problems arise once it’s too late? What if you could monitor devices to find out when something is due to break or need attention? Take the example of the communal printer on one floor of an office building. How frustrating is it when you’ve sent your document to the printer, only to get there and find out the ink has run out. Then you go to the replace the ink, only to find there is none available. Via sensor technology, you could set the printer to send a message, usually through a gateway of some sort, to the BMS system as soon as the ink level reaches 25% with an automatic work order being created, and new ink being ordered and delivered before the old ink runs out. Based on personal experience, I have wasted an average of 5 minutes per day waiting for the printer to work or reporting the lack of ink. This could waste 20 hours per employee per year! The particular floor I worked on could accommodate 500 people, meaning an enormous 10,000 hours of employees’ time could be wasted every single year! I have seen a meteoritic rise in 2018 of the number of customer enquiries asking if we can help streamline the cleaning schedule for their large office buildings. In general, restrooms are cleaned in the same order, and at the same time each day. One major flaw with this system is that at least one set of restrooms is likely to be closed for cleaning at peak times of the day. Speaking from personal experience again, the restrooms closest to my desk were cleaned every day, without fail, between 12:30 and 13:00. Most of my colleagues would use their lunch break to use the restroom, if only to wash their hands before eating lunch. Knowing the restrooms would be out of use, colleagues would leave their desks 5 minutes earlier, eating into the company’s time, a potentially loss of another 10,000 employee working hours per year! Not only were people using the company’s time, but they would often find that supplies e.g. toilet roll, soap and hand towels were running low. How can IoT help? This is one of the simplest but highly useful sensor solutions currently on the market enabled by the energy harvesting technology from EnOcean. 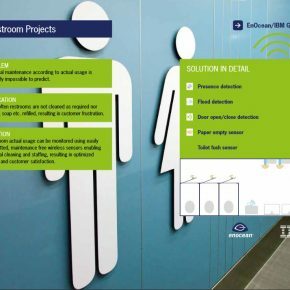 A self-powered wireless door sensor using solar or kinetic energy on each stall, plus solar-powered presence detection sensors above urinals and sink areas linked to an EnOcean gateway, and into the greater cleaning and/or BMS system. It seems an obvious thing to say, but one thing to note is that some assumptions have to be made e.g. every time the stall door sensor detects an open/close motion, the toilet has been used. Another assumption would be that each person standing in the sink area would wash their hands with soap. 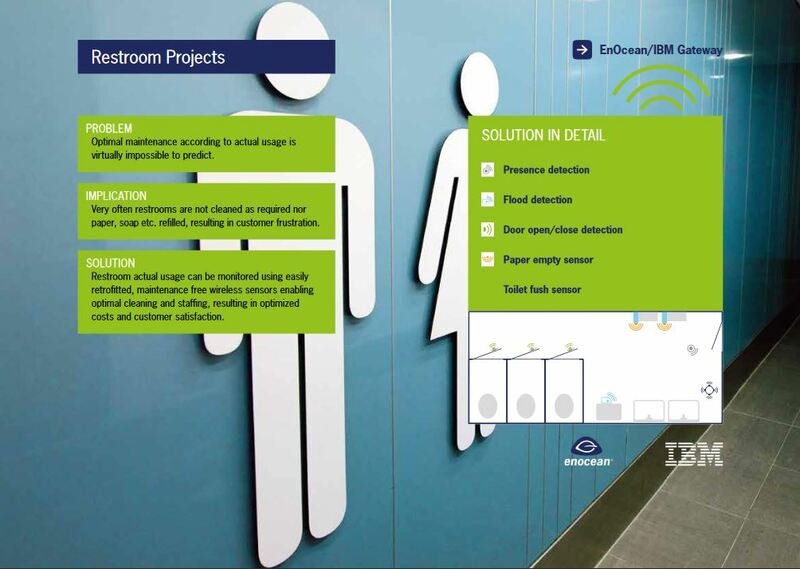 By collecting this data, a fluid cleaning schedule can be created, allowing those restrooms in most need of urgent attention to be cleaned first. Humans are creatures of habit, but with flexi-desking becoming ever more popular, it can throw a spanner in the works for people who have a preferred desk or area. There could be any number of reasons why a person could be 5 minutes late to work e.g. late running public transport and this could mean they can’t sit at their usual desk due to it being occupied. To some people this may seem trivial, but it can cause differing levels of anxiety for employees who are used to a specific routine. 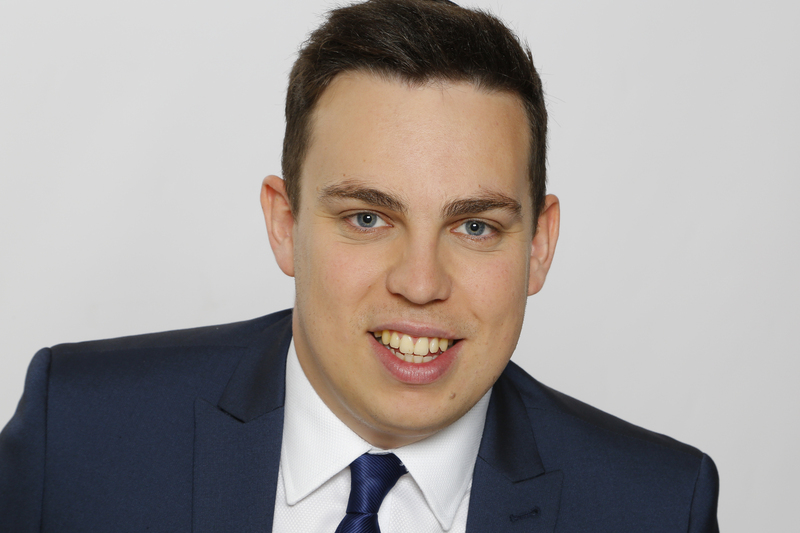 So, how can IoT help with a flexi-desk policy? 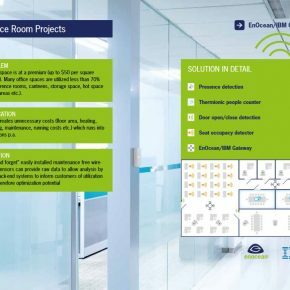 Another simple EnOcean-based solution would be to install seat and/or desk occupancy sensors, and door contact sensors alongside presence detection sensors for meeting rooms. By processing live data through a gateway into an employee accessed application, you will be able to see where free desks or rooms are immediately, instead of walking aimlessly trying to find a free space. But what if the desk is already taken by the time you reach it? Adding one simple feature to an employee application could allow the reservation of a desk. The employee would then have a set number of minutes to get to the desk e.g. 10 minutes from entering the building. Once the employee is sat at the desk, the sensors would notice this, and update the application, saving that time aimlessly wandering round the office in search of a place to work. You’ve probably noticed a common theme throughout this blog. I haven’t focused on the cost of a solution, but on the time and cost savings by implementing such a solution. The meeting room and desk example is exactly the same. Self-powered wireless sensors build the basis of such an installation. Using the surrounding environment as energy source (motion, light, temperature differences), the devices work without batteries and are therefore maintenance-free and highly flexible to place. The EnOcean wireless standard (ISO/IEC 14543-3-1X) in sub 1 GHz ensures reliable communication between the sensors and receivers within the building with an indoor range of up to 30 meters. A gateway provides the valuable sensor information to intelligent IoT platforms such as IBM Watson for a smart data usage. Large organisations could easily save hundreds of thousands of working hours by implementing these solutions and systems with the two keys being increased employee productivity and energy/cost savings. 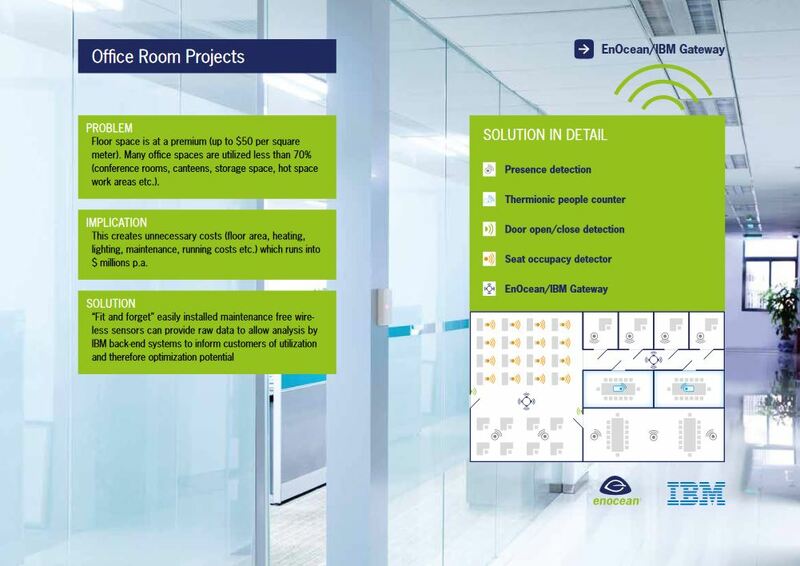 Please take a look at: IBM & EnOcean: Self-powered Wireless Sensors and Switches for Cognitive Buildings document for more examples of the self-powered IoT solutions enabled by the EnOcean technology and the EnOcean wireless standard (ISO/IEC 14543-3-1X). Next PostSmart Lighting owns the ceiling – but what about the walls?